Part of the fun of attending a baseball game is keeping score. Whether it’s your child’s Little League game, your friend’s High School game, or a Major League game at your favorite ballpark, keeping score is a tradition nearly as old as the game itself. You can be ready for an entire baseball season with printable baseball scorebook sheets. With printable baseball scorebook sheets from Microsoft, you will always have a score sheet at your disposal whenever you need it. It can be used for every level of the game and it will never expire. You can download, save and print these easy-to-use baseball scorebook sheets for free. Simply click on the download link located on this page and begin using the baseball scorebook sheets for free today! The baseball scorebook sheets come in the form of a Microsoft Excel workbook. After downloading the sheet, either save a copy of a file to your computer or print them off. There is no limit to the amount of times you can download the baseball scorebook sheets. There are also no restrictions on the amount of times you print the sheet out. The baseball scorebook sheets are traditional score sheets that have been appearing at baseball games for decades. With these sheets, you can keep track of all the offensive and defensive stats within a single game. You can also track all the pitching stats for both the starters and relievers. At the bottom of the sheet, there is space reserved to add your name or the name of the person who is scoring the game for you. Fill up your scorebook and track all the action with the downloadable baseball scorebook sheets from Microsoft. 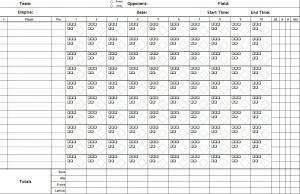 Download and print the baseball scorebook sheets for free right here today, courtesy of MyExcelTemplates.com!